About 600 homes and businesses in Northern Ireland are still without power after Storm Ophelia struck on Monday. Schools across Ireland were closed for a second day, as the clean-up got under way. NIE Networks has said that more than 53,000 customers have had electricity restored, and engineers will continue to work through the night. The Newry and Downpatrick areas remain the worst affected. In the Republic of Ireland 137,000 homes and businesses remain without power, and 48,000 without water. Flights and ferries were cancelled throughout Ireland and many roads closed due to fallen trees on Monday. 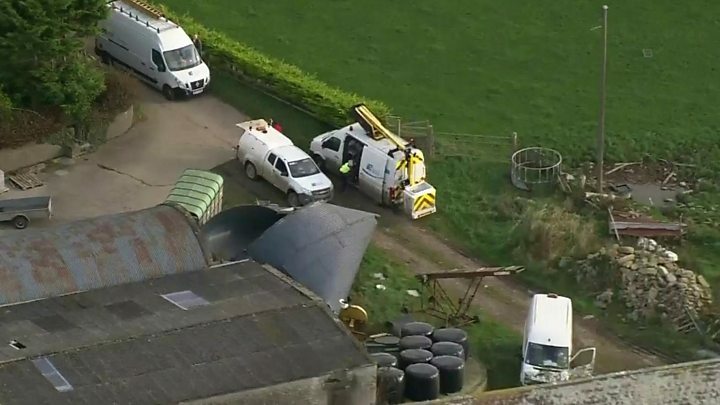 The Republic of Ireland was worst hit - three people were killed and restoring the electricity supply to all customers is expected to take days. Police in Northern Ireland fielded 461 storm-related calls between 07:00 BST and 21:00 on Monday. A meeting of Northern Ireland's Civil Contingencies Group took place on Tuesday at 08:00 "to give maximum possible support to the multi-agency responders and support public safety". "Today is about recovery and getting on with the work of clearing up and getting people back to their daily routines as safely and quickly as possible," said the group's chairman, NI civil service chief David Sterling. He urged people to be aware around large trees and electric lines. "Contractors should also check all scaffolding to ensure it hasn't moved during the storm," added Mr Sterling. On Monday night, NI's Department of Infrastructure said it had received about 400 road-related incident calls. "All motorways are open and advisory speed limits have been removed. At present of 200 roads impacted, around 40 roads remain closed," a spokesman added. School bus services are not running until schools are reopened on Wednesday. The decision to shut schools in the north for a second day been criticised by some parents, especially as the Met Office told education officials that the worst of the weather would be over by Tuesday morning. A spokeswoman for the Department of Education said: "Other considerations included potential power outages in schools, risks to travel arrangements including school buses and timelines for inspection of safety at schools as a result of the severe weather conditions." Principals, parents and pupils were at least given more warning second time around - some headteachers had criticised how late they were instructed to close their schools ahead of Ophelia's arrival on Monday. All further education colleges are closed on Tuesday, but Queen's University and Ulster University stayed open. Schools were also closed for a second day in the Republic of Ireland. The island of Ireland was on high alert on Monday and people were advised to stay indoors and not to make unnecessary journeys. Many businesses shut early to ensure staff made it home before the worst of the storm hit, turning many city centres into ghost towns. 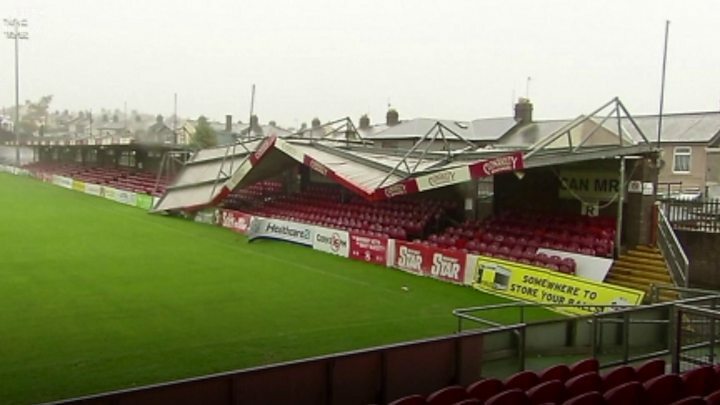 The remnants of Hurricane Ophelia made for one of the most intense storm systems to hit the Republic of Ireland, where a national emergency was declared. The south-west coast is thought to have suffered the brunt of the damage, with Cork one of the worst-hit areas. Irish Lifeboats had to rescue three men on a yacht after they got into trouble in the storm. The men had been trying to get to safety in a harbour but were constantly pushed back by wind and tides.